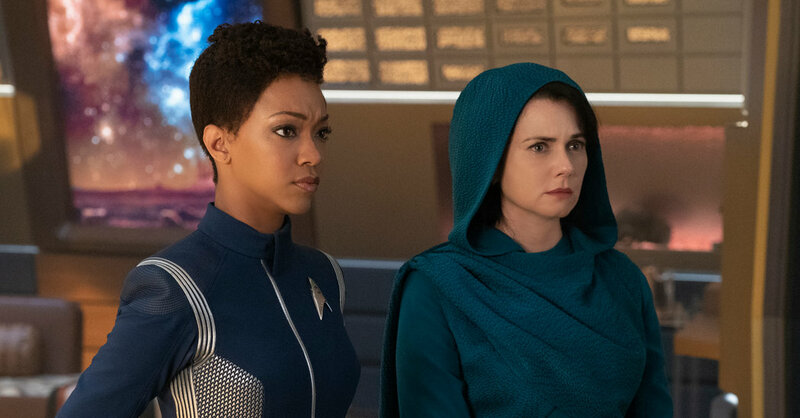 Star Trek: Discovery: ‘Star Trek: Discovery’ Season 2, Episode 3: Guess Who’s Back? It’s not a coincidence that this episode featured the return of the Klingons (this time with hair! ), one of the most confusing plot points of the first season. The writers for “Discovery” — this was penned by Andrew Colville and directed by Olatunde Osunsanmi — backed themselves into a corner with where they last left the Klingon Empire. L’Rell is now the chancellor because Starfleet planted a bomb deep inside Qo’noS, and Burnham gave her the detonator to use, essentially, to blackmail the Klingon High Council to make her the boss. If it didn’t, she would blow up the Klingon homeworld. What a way to win loyalty from the troops: Make me your leader or else I will blow up this planet and no one will be a leader. Of course, as we see in “Point of Light,” some houses are unhappy about L’Rell’s ascension. But not because of the blackmail. It’s because L’Rell’s torchbearer — essentially the Hand of the Queen — is Ash Tyler, also known as The Artist Formerly Known As Voq. Of course, they’re unhappy. Why would Klingons, who are known xenophobes (“Remain Klingon!”), be comfortable with a human as L’Rell’s deputy? Especially one with known Starfleet ties? Why would anyone think this would work? Somewhere along the way, L’Rell found time to get pregnant with Tyler’s child, whom we meet in this episode. This leads to a kidnapping, a fight scene and L’Rell needing the help of Section 31, Starfleet’s rogue spy group, to remain in power. Tyler’s undoing comes because he reaches out to his former lover, Burnham, to pass on crucial information about the potential disintegration of the fragile piece among Klingons, which L’Rell’s opponents see as treacherous. And they have a point. And somehow — “somehow” seems to be a common word when it comes to the Klingon story line — L’Rell is able to convince the Klingons that she cut the Tyler’ slaughtered her son so she cut off his head, and that her biggest challenger died defending her. The other Klingons now believe in her as a leader (I guess?) and don’t question how convenient all of this is. If you had trouble following all of this, don’t blame yourself. It was all a bit confusing because we don’t know much about L’Rell’s rivals and we can barely understand what they are saying. The “Discovery” team did not solve the problem of how difficult it made Klingon words to understand for the viewing audience. Even when they were speaking English, it sounded garbled. Amanda Grayson, Spock and Burnham’s mother, witnesses all of this because she’s paid a surprise visit to the Discovery. Mia Kirshner does admirable work here as Grayson, delivering the warmth that is a contrast to Sarek’s coldness. But boy, how easy was it for her to steal a Starfleet officer’s top secret medical files. Burnham tells Grayson that she did something “irreparable” to drive Spock away, but won’t tell her what. Eventually, after sharing another tender moment with Burnham, Grayson leaves and says she’ll go find Spock. And if there weren’t enough stories crammed into this episode, Tilly’s imaginary friend ends up being a fungus that created hallucinations of someone from her childhood. • Angelic figure update: So Spock apparently saw the vision as a child and used it to find Burnham, who had run away. And somehow this is something that Sarek and Grayson never thought to mention to Burnham. Ever. Not even in passing. Either way, just more of what remains this season’s most compelling mystery. • I’ll have more to say on Section 31 as we see how the plot unfolds, but it was a welcome sight to see Michelle Yeoh as Georgiou again to close out the episode. Reader, Writer, Bullet Journalist, Book Group Organiser, Librarian. Maker of lists, drinker of tea. hoarder of books.Love urban fantasy, dystopian post-apocalyptic, zombies, crime fiction, time travel, 19C fiction and young adult anything.Minimalism was never my thing.Books make me happy, lots and lots of books.And cats. And stationery. This entry was posted in Currently Watching and tagged currently watching, NYT TV news. Reader, Writer, Bullet Journalist, Book Group Organiser, Librarian. Maker of lists, drinker of tea. hoarder of books. Love urban fantasy, dystopian post-apocalyptic, zombies, crime fiction, time travel, 19C fiction and young adult anything. Minimalism was never my thing. Books make me happy, lots and lots of books. And cats. And stationery. Why Is Everyone Suddenly Talking About Michael Jackson?